Moving to the country, with its rolling green hills, fresh air and being close to nature is supposed to be relaxing and fun. Bella is so excited her family has recently moved there and has started to make friends, including Tom and Kizzy who live on a real-life farm. When an invitation to spend a day at their farm along with her brother Sid is forthcoming, Bella cannot wait and thinks it will be the best day ever. That is until her other new friend, who lives next door – Magda, invites herself along. But nothing can spoil Bella’s excitement and really what could possibly go wrong? What follows is nothing short of catastrophic, author Chris Higgins has captured the nuances of friendship and how innocent comments can come back to haunt you in the most hilarious way. All the children are excited about spending the day together, exploring the farm, playing with Fetch the dog and talking to the cows. But Magda is a bit of a free spirit and doesn’t always listen or think the rules apply to her. First there was the picking of all the flowers in the greenhouse and eating all the raspberries meant for the upcoming Farmers Markets. Then driving the tractor, which knocked down a wall and let all the cows out. The cows make their escape through the wall, down the country lanes, stopping traffic and leaving cowpats in their wake, managing to destroy a wedding. Bella knows that when Magda causes mayhem, she also gets into trouble. 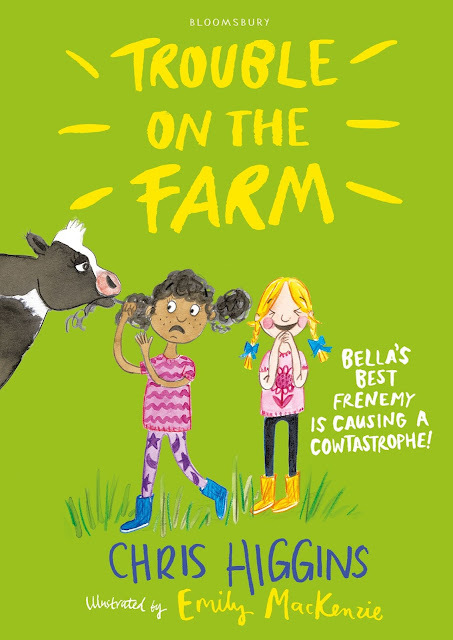 The black and white illustrations add to the hilarity depicting the scenes of mayhem from the unintentional game of cowpat golf, to rolly-polly down the hill to rid themselves of cowpat residue to Magda creating havoc on the tractor will have you laughing out loud. Can Bella save the day? Without Magda causing more mayhem? Or will she lose her new friends or worse never be allowed out to play again?